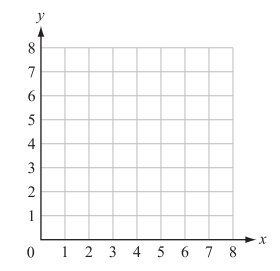 A coordinate plane is shown. A polygon is formed with vertices W, X, Y, and Z. Which type of polygon is formed? Start by plotting the vertices and connecting them to form a quadrilateral. The created figure has 4 right angles. This can describe a rhombus, square, and rectangle. Because the sides are not all the same length, the figure must be a rectangle. The figure that is created has four right angles. Out of the given answer choices, this can only describe a rectangle. A shape is plotted on a coordinate plane using the following points: , , , and . What shape is it? There is not enough information to determine the shape. If you plot these points on a coordinate plane, the shape has four sides and opposite sides are equal and parallel, but all sides are not equal. Therefore, it is a rectangle. A shape with points , , , and is plotted on a coordinate plane. What shape is it? Since each side is equal to each other, the shape must be a square. Start by plotting and connecting the vertices to create a quadrilateral. The figure that is created has 4 right angles and sides of equal length. The only answer choice that shares these characteristics is the square. 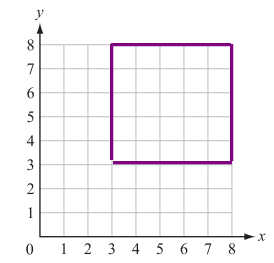 A square is plotted on a coordinate plane. It includes the following points: . What is the remaining point? Each of the points is written as an ordered pair. 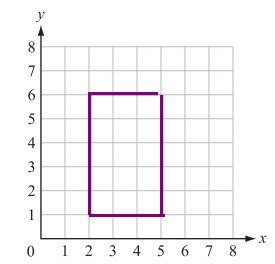 The first number in each ordered pair shows where the point is located on the x-axis. The second number in each ordered pair shows where the point is located on the y-axis. If you plot the ordered pairs listed in the problem, the ordered pair that is needed to complete the points of a square is . Where in Quadrant one of the coordinate grid would Renee have to plot Point D so that the points form a square with vertices A, B, C, and D, and forms sides AB, BC, CD, and DA? Once Points A,B, and C have been plotted the missing coordinates in order to form a square (all sides being equal), Point D would be (2,7). 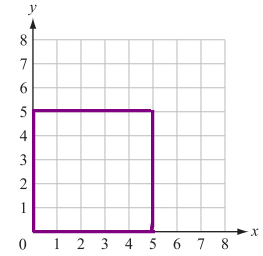 All coordinates (x,y) in Quadrant one will be positive integers. Another approach is to calculate the distance between each point. When Point A and Point B are plotted they form a horizontal line that goes from 2 to 7. That makes the distance . When Point B and Point C are plotted they form a vertical line that goes from 2 to 7. That makes the distance . Point C creates a vertical line with Point B. That makes the distance . From here, we want to find a point that is horizontally 5 units from Point C and vertically 5 units from Point A. Thus (2,7) is the correct answer. 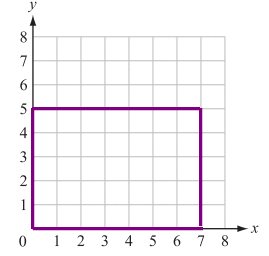 A square is plotted on a coordinate plane. It includes the following points: What is the remaining point? In which quadrant is the point located in? From the origin is to the right 5 and down 6 making it in quadrant IV. Nova Southeastern University, Bachelor of Science, Neurobiology and Behavior.